Becky Selengut makes food relatable and remarkable. BITTER AND SWEET. Becky Selengut designed her new book, How to Taste, as a guide to the underlying principles of what makes food flavorful. This article appears in print in the December 2018 issue. Click here for a free subscription. 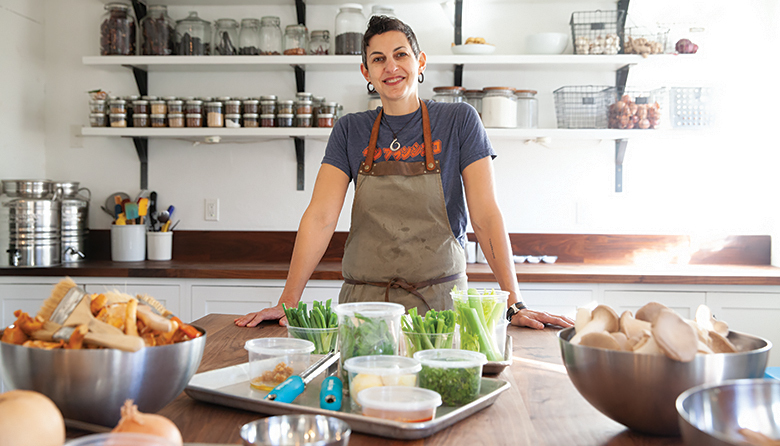 Becky Selengut is a chef, teacher and food writer. She is the author of several books, including How to Taste: The Curious Cook’s Handbook to Seasoning and Balance, from Umami to Acid and Beyond, published earlier this year by Sasquatch Books. What do you do? Everything outside the restaurant business that someone in food might dabble in: private chef, writer of freelance articles and books, teacher at The Pantry and PCC Community Markets as well as private teaching, plus I have a YouTube channel and I’m a cohost at chefsteps.com. What is the key to being a sole proprietor? Diversify! When the crash happened in 2008, I had all my eggs in the private chef business and all my clients decided that having a private chef was too much of an extravagance. That’s why I now do so many different things because if one area slows down, I’ve got lots to fall back on. Name a chef, living or dead, you’d like to have cook for you. Oh, man. I’ll go old school with Jean-Georges Vongerichten because he combines flavors in a way that blows my mind. You knew Anthony Bourdain. Describe the impact he had on your work. He’s one of the first chef/writers I aspired to emulate because his own voice was so palpable in his writing. I wanted my writing voice to be as authentic as his. He also deeply cared about people and other cultures and was a truly kind, genuine, down-to-earth person. Who has mentored you and what has that mentorship meant to you and your career? Jerry Traunfeld was my biggest mentor. I worked for him at the Herbfarm and he inspired me with his curiosity about food and his ability to combine things with balance. Do you have a favorite unhealthy processed snack food? Fritos dipped into sour cream mixed with tabasco. A big bag or a mini bag? Big! A mini bag is insane. Did you grow up in a family where cooking was important? Not in my immediate family, but we would meet at my Grandma Dorothy’s table every Friday night throughout my childhood. My Aunt Sandra was also a wonderful host. There were lots of dinners at her home. When did you decide that food was your passion? I was a lost 26-year-old working at a doctor’s office because I thought I might want to go to med school and become a surgeon. I was always sneaking looks at Gourmet and Bon Appétit under my desk and throwing lavish dinner parties at my apartment. One day, after work, I saw an ad for the culinary program at Seattle Central College and suddenly it all just clicked. Tell me about your latest book. How to Taste is about the underpinnings of culinary theory: How to sense, with your whole body, that the seasoning is just right. Why this food needs more acidity. What to do when a dish is too bitter. Those things are key to being successful in the kitchen, especially if you want to move away from following recipes. What’s the secret to writing a user-friendly cookbook? Get multiple testers on every recipe by cooks from all different levels. Also, watch a crew of beginning cooks make a recipe without your being able to answer their questions. I did that and it completely changed how I wrote recipes because as I watched them screw it up, I realized that my writing wasn’t clear. Describe the aesthetic vibe of a successful restaurant. It begins and ends with hospitality. I’ll never go back to a restaurant with mind-blowing food if I didn’t feel welcomed and treated kindly. How would you describe your relationship to money? Pragmatic. I like to pay my bills on time and I don’t like owing money. Do you have a weird/embarrassing habit that you’d be willing to share? I am a shameless bowl licker and a covert finger-swiper of plates. Do you have any secret talents? I can write really well with my toes. For whom would you most like to cook? The people I already cook for — my family and loved ones. For more on artists, entertainers and entrepreneurs, tune in Art Zone with Nancy Guppy on the Seattle Channel.